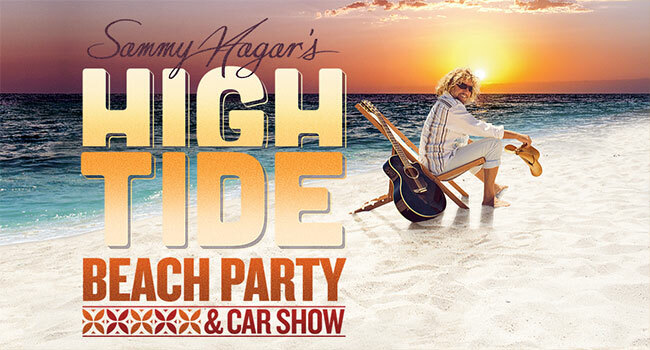 Sammy Hagar has confirmed the initial lineup and details of his inaugural High Tide Beach Party & Car Show on Saturday, October 6th on the shores of Huntington Beach, California. Sammy Hagar & The Circle (featuring Michael Anthony, Jason Bonham and Vic Johnson) and REO Speedwagon will headline — with special guests including Joe Satriani, Vince Neil and more performing with The Circle at the music fest. The lineup will also feature performances from Reel Big Fish, Roger Clyne and the Peacemakers, Tijuana Dogs, Tre Cool’s Dead Mermaids and more. Ticket pre-sale begins Thursday, June 28th at 7 am PT/10 am ET and the public on sale begins Friday, June 29th at 7 am PT/10 am ET via HighTideBeachParty.com. In addition to the stellar lineup, Sammy Hagar’s High Tide Beach Party & Car Show will showcase an amazing collection of luxury, exotic, European, custom, classic, movie and hyper cars – many as iconic as their owners. Fest-goers can enjoy several specially curated food and drink offerings including a beachside outpost of Hagar’s legendary Cabo Wabo Cantina. The Cabo Wabo taqueria grill will serve authentic handmade tacos, delivering big Mexican flavors north of the border. Bars located throughout the fest will feature perfect cocktail pairings including margaritas and specialty drinks featuring Santo Mezquila and Sammy’s Beach Bar Rum, as well as beer, wine and other refreshments. In true beach party fashion, the fest will also feature beach activities, games and more.